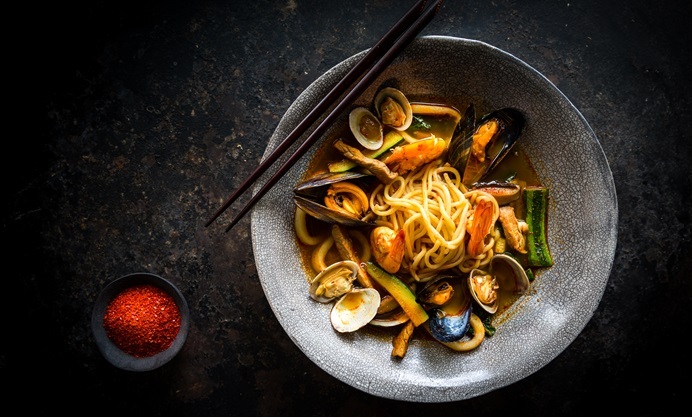 The key to this stunning jjamppong recipe lies in the intense broth, which is rich with gochugaru chilli flakes for a wonderful depth of flavour. 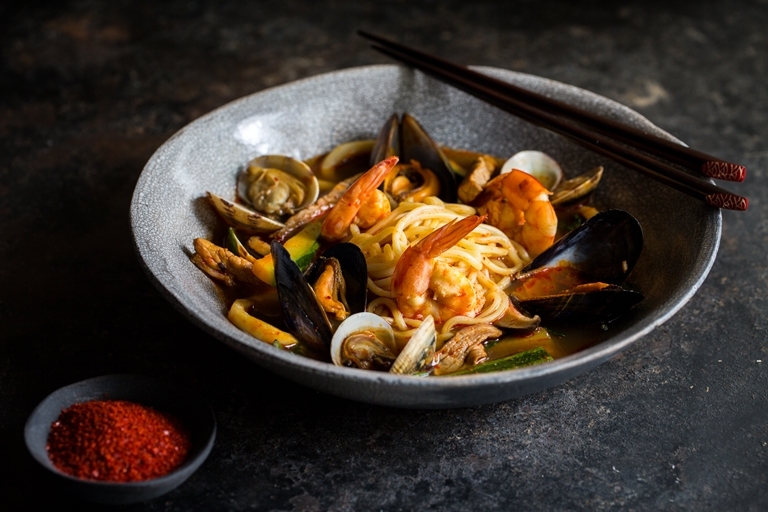 Use whatever combination of seafood and vegetables you prefer for this wonderful Korean dish. Jjamppong is a popular Korean dish, said to have been originally created by Chinese immigrants living in the Japanese port of Nagasaki. The word ‘Jjamppong’ comes from the Japanese word for mix, which explains why there are quite a few variations of this dish. It is usually based on a varied assortment of seafood with noodles and vegetables, but can also include pork. The key to this dish is the fiery red soup base created with smokey Korean chilli flakes called gochugaru. For an authentic taste, is not advisable to substitute gochugaru for regular chilli. Two tablespoons may seem like a lot to use in this recipe, but gochugaru is actually relatively mild in comparison to regular chilli powder. Easily and inexpensively available online, these smoky chilli flakes are regularly used in Korean cuisine to make many dishes, including Kimchi, Bulgogi and Tteokbokki. You can also use an leftover gochugaru as a seasoning to add to dipping sauces and marinades and as a spicy rub for roast meat. 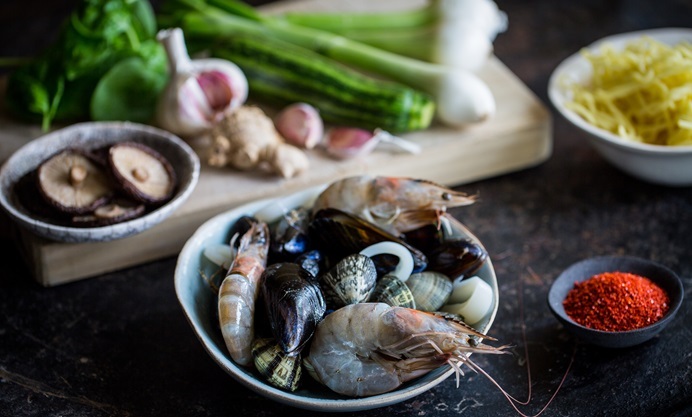 I love the combination of mussels, clams, squid and prawns, but as the name of the dish suggests, feel free to change the shellfish according to preference and availability. You can also omit the pork if you prefer and add a few more vegetables. The dried shiitake mushrooms do need pre-soaking for a couple of hours beforehand, but otherwise the recipe is quick to prepare. Why not serve this impressive, yet easy, dinner party worthy dish alongside Japchae, Bibimbap or Bulgogi with a side of Kimchi, for a hearty Korean feast.